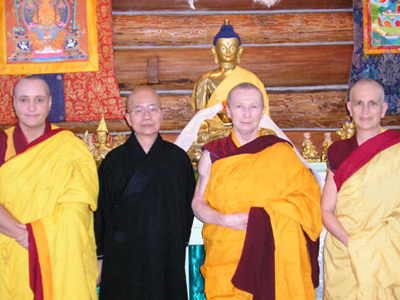 The Committee of Western Bhikshunis was formed in the autumn of 2005, after His Holiness the Dalai Lama told Bhikshuni Jampa Tsedroen that the Western bhikshunis should be more involved in helping to establish the bhikshuni ordination in the Tibetan tradition. The members remained in contact via email and met in March 2006 at Sravasti Abbey in the USA, to research the manner of giving bhikshuni ordination and to prepare a paper which was circulated at the meeting of vinaya experts in Dharamsala in May 2006. Ph: (619) 260-4600, Fax: (619) 260-2260.